On the few brochures I have seen with reference to Monifieth, it is inevitably described as having been an important Pictish Centre. This prompted me to question where was this factual information recorded. Had someone gathered all the facts, collated them into some form of essay or manuscript? If there is such a document then I have still to locate it. Of course this comes as no great surprise as the history of what we now know as the Angus town of Monifieth has very few written historical records of its existence or industrial and social community development . 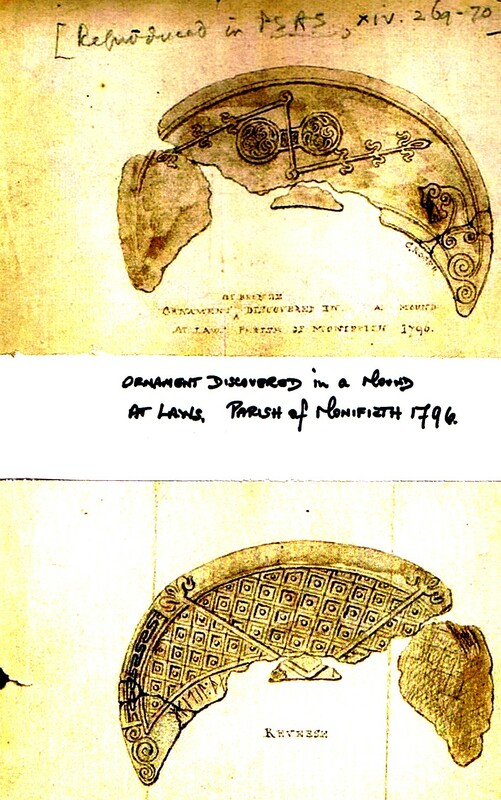 Was Monifieth a centre of Pictish activity? The Picts left no written records in fact there is no definite conclusion as to the language spoken by them. Records were made regarding these `people’, however, they were written by the Romans & the Irish, some, centuries after the events. Unfortunately enemies do not always record the true pictures or record of events. This means that what one reads in books and papers can be fact or fiction depending on the honesty and reliability of the information source. Like a complicated word puzzle formed by linking together various myths and stories then perhaps we might uncover some answers to our questions.As further confirmation to the findings of the written word, we could where possible, examine any physical evidence available today. The Picts have captured everyone`s imagination, unlike any other ancient people. They have been described as mysterious, sun worshipping naked warriors, who covered their bodies with tattoos. For nearly 500 years they dominated northern Britain remaining free and unconquered beyond the borders of the Roman World. They represent a Celtic civilization who were the first barbarians to form a recognisable nation. They were the first Celtic speaking group which dominated Britain, Ireland and central Europe. This explains the unusual customs: their provinces were inherited through the female line, the new Queen taking a male consort for marriage and defence, generally from outside the community.Their weapons, forts, social organizations, marriage customs and clothing were not so radically different from those of other communities who occupied Britain. The Picts were not a race, although they might have briefly been a nation. At the end of the last ice age around ten thousand years ago, what we know as the land mass of Scotland and England was joined to mainland Europe. A few wandering tribes of nomadic people migrated to areas, where the ice had receded, leaving them free to hunt and fish. Some of these tribes were short, with black hair and dark skin from where we today know as the Iberian Peninsula. Others from the Scandanavian countries with fair hair & blue eyes, they fit what was described as Pictish characteristic features. A few sturdy people with red hair and blue eyes similar to the Irish were described as Pictish warriors. These facts give us no clear picture of their physical characteristics. It is said that similar to the people of today they had their own aspirations in music and the art, forecasting, weather and very knowledgeable in the use of herbal medicine. They were extremely artistic and very skilled in the use of tools, making jewellery and sculptured stones. It has been written in `Historia Norwegia` a Scandinavian text of the thirteenth century: These islands were first inhabited by the Picts and Papae. Of these , the one race, the Picts , little exceeded pigmies in stature. They did marvels in the mornings and evenings, in building walled towns but by midday they entirely lost all their strength and lurked through fear in little underground houses. The Papae were Celtic priests , specifically all monks and hermits who made their dwellings on remote isles around the coast of Scotland. The walled towns are most probably Brochs and the underground houses Souterrains. It could be that the Pictish tribes were exactly similar to the present population of Scotland. Migration continued over the centuries with the `hunters, gatherers` gradually settling in one district where they began to clear ground for growing a few crops and raising domestic animals. Eight thousand years ago following a massive `land slip` the North Sea was formed and Britain became an Island. This tsunami type event meant that the only method of migration to or from the island was by boat. Cat ruled for twelve years the area Caithness, Sutherland, WestHighlands, Northern and Western Islands. Fidach for forty years ruled Moray, Nairn and Ross. Ce ruled for fifteen years Banff Buchan and parts of Aberdeenshire. Fotlaig ruled for thirty years Athol, & Gowrie. Circinn ruled for sixty years over Angus and the Mearns. Fortrenn ruled for over seventy years Strathearn and Menteith. Fib ruled for twenty four years over Fife and Kinross. This legend indicates that there were various groups of Picts under their own leaders or `Kings`. This description was, of a nation formed by different groups and tribes or as they much later became known as clans. A similar comparison would be the manner in which reference is made to the native inhabitants of North America as being `Red Indians` when we know that there were Apache, Sioux , Blackfeet and Cheyenne, with many others forming the North American Indian nation or the Maori and Aborigines of Australasia. Until the Roman invasion the various tribes were collectively named `Cruithne` by the Irish, which is probably more accurate than Pictii or `painted ones` recorded by the Roman Eumenius in 297AD. Did they paint their skin in times of battle for recognition or as `war paint`, again similar to the Indians or other tribal warriors? In the third century there were several more tribes noted in what is now Scotland, Maeatae, Caledonii, Taezli, Venicones. Our main interest lies in Southern Pictland and the areas at one time ruled by Circinn, Fortrenn and Fib. Monifieth was part of South Pictland which extended from the Forth to the Grampians. What is known of the Picts in the early part of history as recorded by learned historians, in the age when the population of what is now Scotland, was around 250 people, the only collection of human`s dwellings was at Ardestie, Monifieth. St Ninian was the first missionary to visit South Pictland, at the start of the fifth century. His people `conversions` to Christianity were short lived, with a return to paganism — the worship of the sun, moon, water, air, day & night, sea, land , rain clouds and wind. The priests were Druids, which means `wise men`. Over 150 years later Columba overcame the pagan worship. In 563AD he had crossed from Ireland to Iona to form his Christian settlement. At Inverness in 565AD he converted King Brude, of the Picts to Christianity. Eventually his mission brought him to the banks of the River Tay. One of his reputed followers the so called St Rule or Regulas. The existing parish Church of Monifieth, StRules, erected in 1812, is built on the site of former places of worship certainly since the year 574 AD and reputedly even earlier. From the around the 8th century a Culdee settlement was formed in Monifieth. These religious monks , of Irish extraction name Ceil De or `men of God` were monastic brothers who served the poor. Although permitted to marry they retreated to what was the solitude of `beehive type cells` for prayer. Unlike the Roman belief of the Christian gospels and the teachings of St Peter this Celtic religion was based on the worship of St Andrew`s gospel. St Rule the said follower of Columba has had his name given to the Monifieth parish Church and the Tower within the ruins of St Andrews Cathedral. One legend credits Rule with involvement in the relics of our patron Saint being brought from Patras in Greece to Scotland. On the hazardous journey, which if it is accurate, in Rules being in the accompanying party, must have lasted about three hundred years .It has been written that another of the accompanying guardians was St Bridget , while others have stated it was St Catherine, both reputedly have historic connections with the local area. The Celtic church in Monifieth survived much longer than in other areas, as records show it still existed into the twelfth century. King Hungas of the Picts, who reigned 729-761 AD , had three sons, who were met by `men of the Church` custodians of the St. Andrews relics ( several bones), at Forteviot, where they gifted a tenth part of Forteviot to God & St Andrew. The group then set forth to meet the King at what today is known as Balmossie, it was then called Moneclatu, where there was a Royal Hall. Moneclatu was later renamed as Monichi— or Holy Place. A church was built at Monichi and dedicated to St Andrew. This was sited at the place where the relics had been placed while resting from the journey. It was named Eglismonichty — Church of the Holy Place. The relics of St Andrew were brought to Pictland about 730 AD and it is significant that King Hungas made in 736AD an endowment of land directly associated with St Andrew at Kilrymont for the erection of a Church and oratories. In token of this gift King Hungas in the presence of nobles and church dignitaries took a turf and laid it as an offering on the altar of St Andrew. Queen Fichem, wife of Hungas was delivered of a daughter Mouren, who later died. She was buried at Kilrymont in consecrated ground. The first to be interred there. The Pictish royal line of descent was matrilineal , that is through the female line, which would indicate the importance of Mouren. There was much rivalry between fathers, sons and male cousins for the Kingship. This could be the cause of much fighting. Hungas although a Pictish King was most probably of Irish blood being the son of Fergus. The Royal Hall was most probably within a close distance of the Laws fort, where in times of danger the local residents would with their `goods , chattles and stock` seek refuge within it`s protective walls. In his book the `Monikie Story`, the Rev Douglas Chisolm tells a story of `women with children, slowly making their way up the hill, the struggling group eventually going through the opening to safety in the walled ditches of the fort. The men already there, on guard watching for the approaching enemy. Who were their enemies, other Pictish tribesmen, Romans, Danish Vikings, people who would attempt to enforce upon them Christian conversion.? The Celtic Church survived in Monifieth for many centuries, with reference frequently made to the Abbot of Monifieth. The Church with its land and properties was gifted to the Abbey of Arbroath by Matilda Countess of Angus in the 12th century. What became of the Pictish people? There is no real answer to the question. No records of them being `wiped out` in battle exist. They were in fact very successful warriors as proved by the result of the Battle of Nechtansmere and later many victorious battles fought by King Hungas. 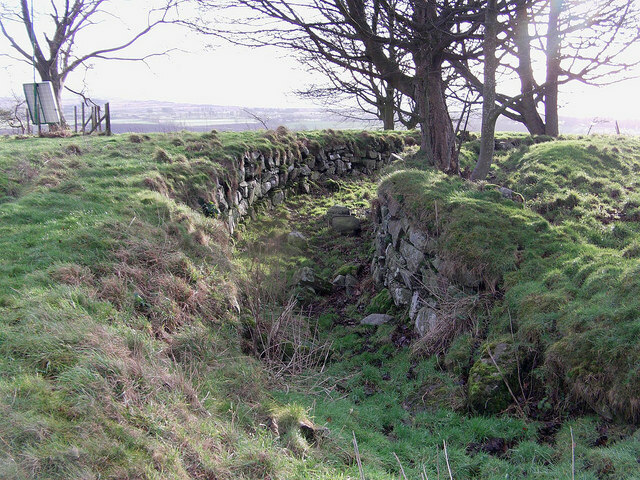 The Romans built Hadrian`s and the Antonine walls to protect themselves and their interests from the `warriors of Pictland`. They were accomplished sailors with a fleet of boats, large enough to convey troops of Hungas to `do battle` in Ireland. There were constant crossings between the Western & Northern Isles. Perhaps with the increased population and migration a gradual integration of the peoples occurred absorbing the Pictish people into some similar race, forming what is now the Scottish nation. Contrary to many conflicting tales presented in Scottish Chronicles, written much later than the Pictish era, there was no mass destruction or genocide involved in the nations disappearance. It would appear to have been purely political following the defeat by the Scots. Eventually the process of change evolved and continued throughout much of the ninth century. Kenneth Mac Alpin, was left with only the noble leaders of Pictavia. Those remaining whose fate lay in the hands of the new regime. The old customs, traditions and language were discarded. The process happened quickly and was spurred on by the belief that the entire Pictish nation had been completely wiped out. This belief was so firmly embedded being openly stated at the highest levels. It appeared in the Declaration of Arbroath, the affirmation for Scottish Independence, drawn up in 1320 in defiance of English aggression. The Declaration sent to the Pope urged him to accept the Scots as rightful masters of Scotland because “they had utterly destroyed the Picts”. Several explanations were written probably in the 11th or 12th century, following the reign of Kenneth Mac Alpin, “by way of understanding for the disappearance of the Pictish nation”. One story relates how the “over All King” Kenneth and his followers invited the Pictish aristocracy to a feast at Scone. The feast turned into a massacre of the intoxicated guests, who had been seated on a captive bench placed over a pit where their mutilated bodies were cast down”. This fictional tale of the extermination of the elite is also to be found in varying forms, in Ireland, Wales , Germany and Russia. The vitrified hill fort at Laws of Kingennie is one of the most important memorials of our early ancestors. Covering an area of at least two acres, the buildings and fortifications having taken centuries to establish. Despite the Romans stating `the Picts had neither forts nor cities` they certainly existed according to Adamnan`s `Life of Columba` On his visit to Inverness to the residence of King Brude ~the gate of the castle was closed against him~ and the vitrified fort at Craig Phadric, remains of which still exist , might have been his stronghold. 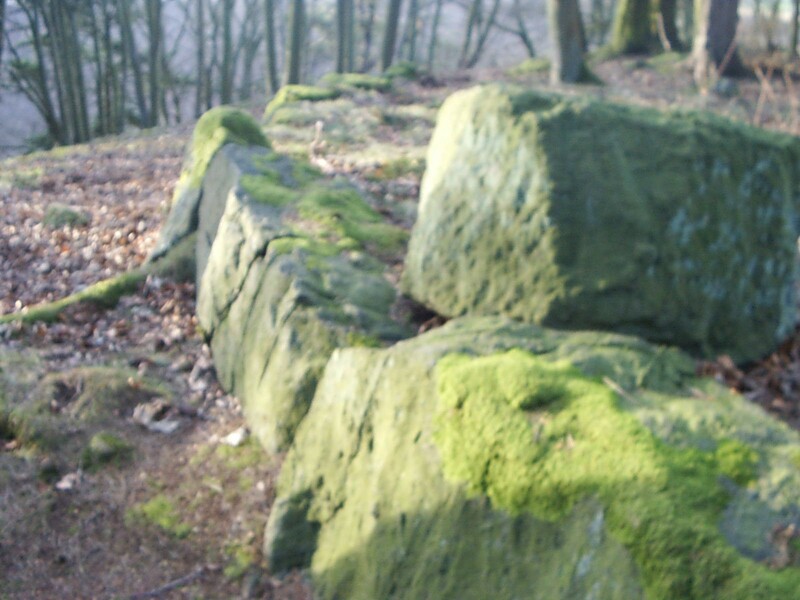 A mile north west of the Laws on a small hill there is a ruinous construction called St Bride`s Ring. Nothing is known of it`s history. It stands upon an apex which juts out on the east side of the hill. The headlands are very precipitous rising to the height of forty or fifty feet above the level of the ground below. The entrance to the structure is on the south, and the hill on this side extends for a considerable distance, widening out as the distance from the fort increases. 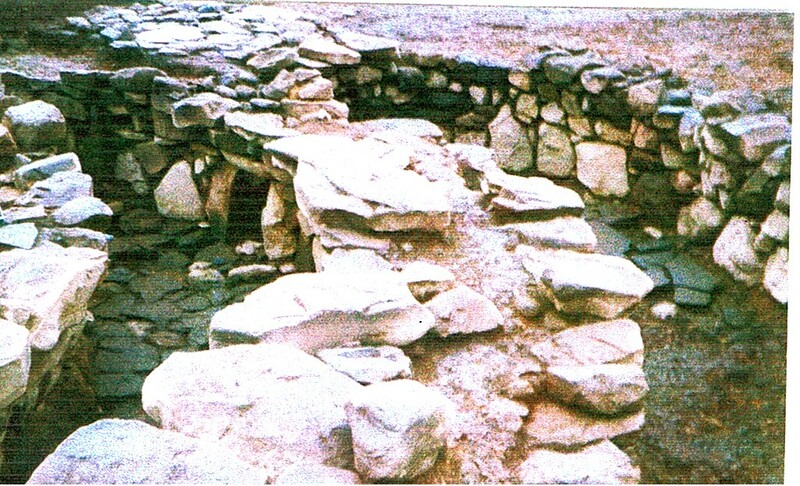 The walls have been formed of undressed stones, the outside large blocks, with smaller stones on the inside. The walls are seven feet in thickness and what remains of them are about eighteen inches in height above ground level. The diameter of the fort over walls is north to south 68 feet 10 inches and east to west 69 feet 9inches , making the diameter inside the walls 54 feet 6inches. Many of the boulders have been scattered and thrown down the base of the hill. The main Broch period was between 600BC and AD100. Well before the start of our Pictish age . These structures were fortified dwelling houses serving a household or village . It has been claimed that that four fifths of them were occupied from the mid fifth to mid ninth century. Possibly this had been a church building in King Kenneth`s time, erected by Irish clergy and dedicated to St Bridget. It`s position being chosen for safety from attacks of Danish invaders. St Bride`s Chapel was sited in what is now the `stack yard ` of South Kingennie farm. The Grange or Grangaria, a store for the Churches tiend sheaves (a form of taxation paid to the Church) was also in this district. Many churches founded in the reign of this King were of Irish design and dedicated to St Bridget or St Bride. The round tower at Abernethy is said to belong to this period— it`s dedication to St Bridget advances the theory that it`s purpose was to act as a stronghold, where church valuables might be safely stored. A similar Round Tower is still to be seen at Brechin, a relic of the Celtic Church. The clergy might also retire to the safety of these towers when marauding invaders appeared in the neighbourhood. The Danes having found `rich pickings` in the monasteries, which had sprung up and plundered what was in easy reach of the shore. About 860 AD they entered the Firth of Tay plundered and laid to waste the country on both shores going as far as Clunie and Dunkeld.The Church at Monifieth suffered greatly at their hands but there is no authentic record of this. A grim struggle took place with the Danes near Monifieth at it`s border with Barry. Under their leader Camus one of Swein`s generals, who having came ashore between Montrose and Arbroath, marched inland, stormed and burned Brechin. Malcolm the second marched from Dundee. The two armies met at Barry links and after a fierce battle the Danes were routed. Camus was pursued and on Downie hill near Monikie received a fatal blow. A sculptured cross was erected to mark the burial spot. At Aberlemno the shattered remains of Camus`s army suffered further disaster . Pursued as far as Cruden they were finally annihilated. The Pictish Cross erected for the Viking warrior does not depict battle scenes as does the Aberlemno stone. It portrays Church dignitaries and cherubins, which might indicate it was a memorial for some important member of the church officials. The Monifieth Sculptured Stones can still be seen in the Edinburgh Museum of Antiquities. The four stones belong to the era of the early Celtic church . Unlike the stones at Aberlemno, Glamis, St Vigeans, Letham and Forfar they are not on view to the public in the district where they were found. 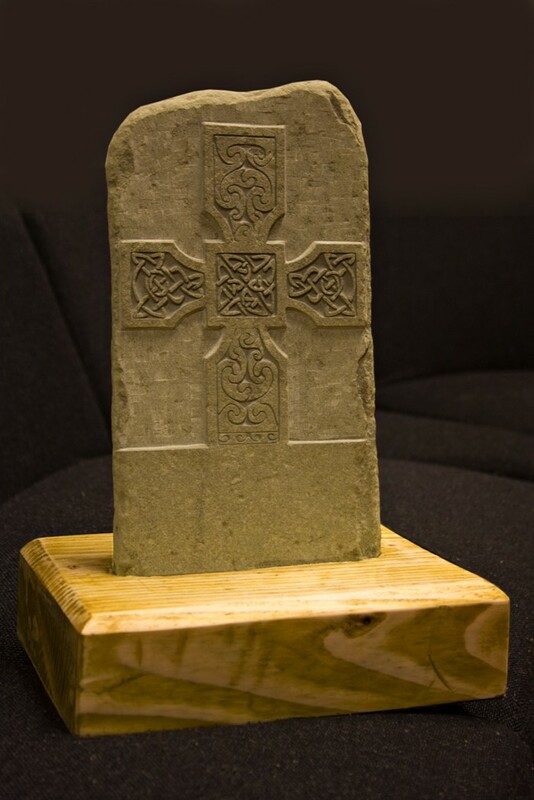 The Fontstane, a base of a Celtic free- standing cross is to be found within the grounds of a private residence. The location and purpose of the cross is unknown, but where it has remained for almost two thousand years was once part of a wood. On early maps reference is made to it being named Chapel Wood, which was part of Grange Estate. Souterrain or `under the earth` structures are to be found and viewed at Ardestie, Carlungie and Ardownie. Built at least two thousand year ago their purpose has not been definitely confirmed. The living quarters or houses were built above ground, with the underground passages, thought to be used as byres, storage areas and places of safety away from marauding enemies. Some say they were easier to maintain out of the wind and hidden from view. Recent excavations of the Souterrain complex at Ardownie confirmed that the passages were`roofed over` with stones and turf. The Ardownie complex was one of the largest and well preserved ~Pictish Souterrain structures~ ever excavated. What it revealed was, over two thousand years ago, the builders had a sound understanding of engineering with uncut stones of great size and weight also the ability to move them into position for maximum strength walls. A sliding door mechanism and lintel discovered, for the first time ever, in a souterrain excavation. It was impossible to examine the whole site as at one point the structure passed under the A92. Aerial pictures revealed what could be another two similar structures close by. Because work had commenced on the upgrading of the A92, the archaeologists recorded, measured and photographed the site before `filling it in`. Once again out of sight , out of mind. Despite being associated with the name of the nearby farm Ardownie, it is in very close proximity to Laws Fort, the site of former Eglismonichty Chapel and on what was Balmossie muir. On the banks of the Dighty water, opposite the `Old Lodge` or gatehouse at what was the drive way to Linlathen House, is a well, known to locals as `The Cauld Water Wellie` or ` St Cats Well`. Similar to other fresh water springs in the district it reputedly had medicinal properties, hence the former classification as a `Holy Well` dedicated to St Catherine of the St Andrew`s relics connection. Another medicinal well St Kane`s was to be located at the former site of Ardestie Castle, near Balhungie. Several burial cists have been discovered on Ardownie hill where quarrying operations are being carried out, others found by men working in the fields. 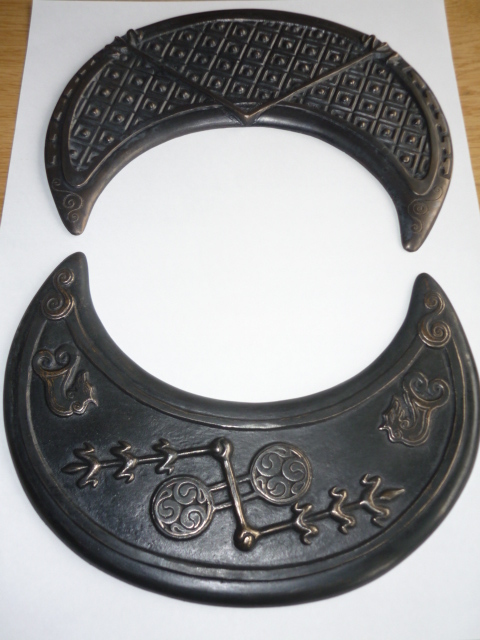 At Laws farm in 1796 farm labourers when putting in a drain through a large mound found a Pictish bronze crescent. Peter Roger, who rented the farm from Sir Alexander Ramsay of Balmain, passed on the find to the landowner. It`s location is now unknown. Charles Roger, the farmer`s grandson, made a drawing of the crescent and it`s elaborate designs. This drawing is now in the National Museum of Scotland. In 1875 when the road to Barnhill was being laid, there was found east of the railway bridge, at a height of about eighty feet above sea level, a Pictish burial ground. In part of the cairn were cists, which contained human remains, an urn, an arrowhead of flint, a small bronze blade and two gold discs. Location of these items are unknown. North of Linlathen House, near Drumsturdy road is a large mound called Cairn Greg, between forty and fifty yards in diameter. Tradition asserts that a chief named Gregory, who normally resided at Colliston, in the parish of St Vigeans, at a place named Castle Gray, was killed in battle here. A stone cist was unearthed in 1834. It contained an earthenware urn, with curious scratched indentations in a zig-zag pattern. Archaeologists claimed this to be of a domestic variety and not a cinerary type. In this instance however, it held the `human remains` of the clan chief. Beside it near at hand as if ready for use lay his weapon a bronze dagger four and a half inches long. The dagger and urn were removed to Linlathen house. This was only two of several belonging to the same age found at different times on the estate. Around 1820 a drain was being cut, east of Monifieth, a primitive canoe was found embedded in the peat moss about a mile from the shore.This would be somewhere in the district of Balhungie. The derivation of the name being taken from the Gaelic meaning Township or Place of Hungie or Hungas. These are only a very few reasons for my belief the Monifieth was indeed a very important Pictish Centre. I `rest my case` and leave you with a list of further reading which might influence your decision. Since this was written Roddy Mathieson has enlarged and cast in bronze the Monifieth Crescent. It will be displayed in the House of Memories sometime during March 2016 for all to see. John Knox was the first to devise a system of education and his aim was to provide in every parish a place of education where even the poorest might be educated. The expense of education to be borne by the Church. Monifieth Heritage Walk	Leaving from the Angus Council Access Office. Over the centuries the spelling of the name has altered many times, as has the conclusions as to the possible reasons for the title. 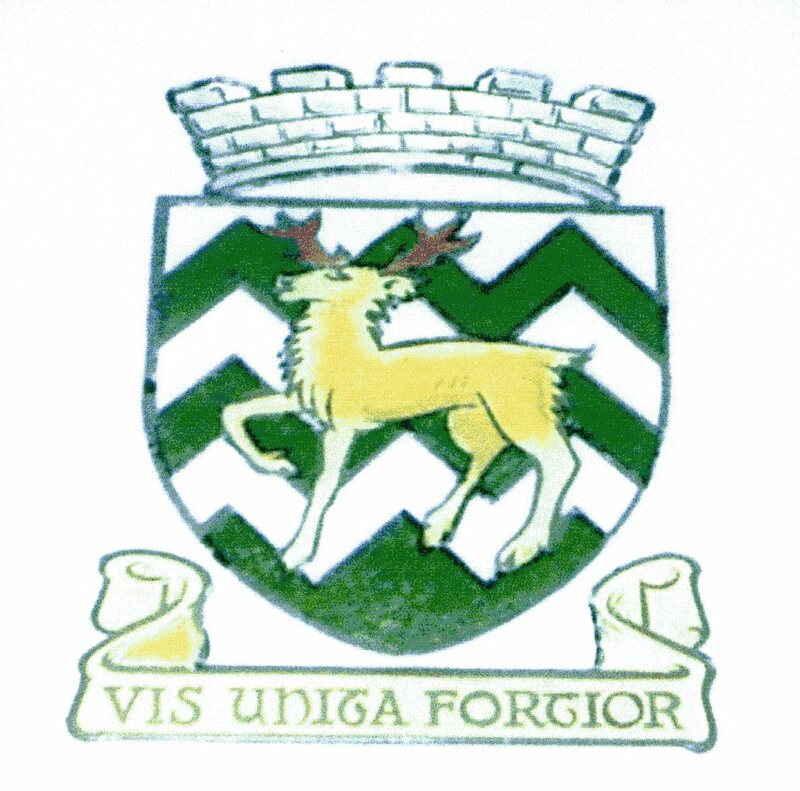 The registered coat of arms carries the features of a stag and a hill, signifying the combination of two Gaelic words Monadh Feidh. However, many are now more in favour of another two similar sounding Gaelic words Monach Fother meaning Monks Land or Holy Place. Over the passage of time Monifieth has indeed been regarded as a historical holy place.